The test above is done on Openstack Havana 2012.2.1 @CentOS 6.5 x86_64. To achieve injection, libguestfs is needed on nova compute hosts. We can see the metadata key-value pairs are stored in /meta.js in the VM. This way needs libvirt_inject_password=true is configured in nova.conf. The random generated password can be retrieved from config drive as well, this will be mentioned later in this post. We can also freely set root password on Horizon GUI when launching the VM. We need enable setting admin password in horizon local_settings.py. Note: It seems Nova CLI does not support setting root password during nova boot, let’s if Heat support or not later. If you set libvirt_inject_password=false, root password can be stilled injected by cloud-init + Nova metadata service. This needs the image has cloud-init pre-installed. Still if you don’t specify the root password, a random password is generated, and showed from the nova boot output. Two ways to inject SSH key, by hypervisor or metadata service + cloud-init service. 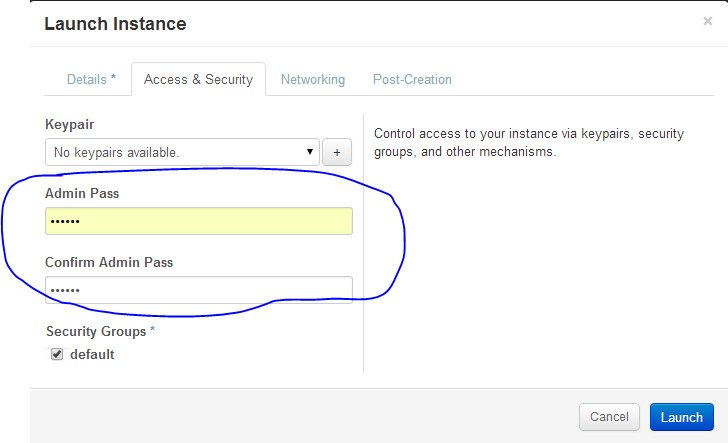 This way works if you don’t have cloud-init in the VM. To make this work, you need disable SSH key injection from nova.conf, and have cloud-init installed in VM. With help of cloud-init or Heat, the userdata can be used in many ways to achieve some post-config steps when a VM is launched. Config drive is an alternative of Nova metadata service, the metadata contents are written on a special drive attached to VM, inside VM, you can mount and read metadata from it. From the config drive, we can find same information as metadata service, plus the injected file. #Check whole “meta” data set of the VM, including root password, SSH key, meta key/value pairs. #The first injected file is placed as /mnt/openstack/content/0000, the 2nd is 0001, and so on.